← Blame Cows for Los Angeles Smog? Hikers and campers need to be careful on trails these days, particularly on the west side of Michigan. Warmer spring temperatures not only brought out the wildflowers, they also brought out ticks. A good friend of mine told me last week of his recent nightmare hike at the Kalamazoo Nature Center. The trails there are delightful. He regularly walks them. But on this trip, he came away thick with ticks. Most were on his clothing, but he found one on his chin under his beard. “I thought I had a growth,” he said, laughing about scratching his chin after getting home and feeling something there. He pulled it out quickly without a problem. He was lucky. State health officials say ticks, particularly black-legged ticks that carry Lyme disease, are no laughing matter. Erik Foster, a medical epidemiologist with the Michigan Department of Community Health said 106 cases of Lyme disease were confirmed in Michigan in 2011. Not all of those cases originated in Michigan. One got the disease in another part of Michigan. Forty others got it while traveling out of state. A couple of those originated in Europe. “We were out two weeks ago, and there were plenty of adult ticks out in Benzie and Leelanau counties,” he said. Foster does research on ticks. He wants to know what makes them tick. 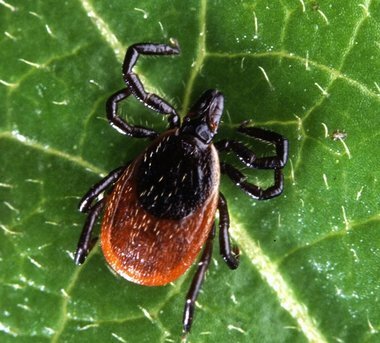 The black-legged tick is one of several species in Michigan, all of which bite humans and may carry disease, but it is the only one that carries Lyme disease. “We worry because they are so small that people may not readily see them,” he said. The infection rate with adult black-legged ticks is 25 to 40 percent and 10 to 20 percent with smaller, nymph-stage ticks. The problem is spreading, according to Foster. 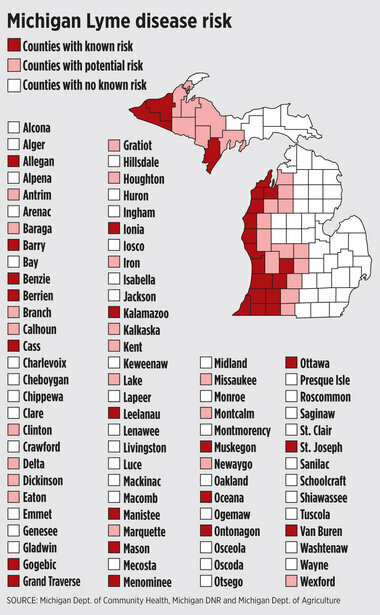 Black-legged ticks were once only endemic in Menominee County. That’s no longer so. It may be hard to fathom how ticks could move north so quickly. Ticks aren’t exactly fast-moving creatures. But birds play a role, as do deer. Ticks move from region to region by hitching a ride. “While we were up north testing them, I would stop every 20 meters and pick them (ticks) off, but a co-worker was wearing the pre-treated clothing and not getting a tick on her clothes. The stuff really works,” Foster said. Tick prevention needs to be a high priority, he said. Black-legged ticks are notorious for carrying Lyme disease, but other ticks, including the dog tick, can carry Rocky Mountain spotted fever. That disease was confirmed in 2010 in a young woman from Kalamazoo, according to Foster. Experts with the Centers for Disease Control and Prevention suggest using caution when camping, hiking, playing outdoors and gardening. Ticks like moist, humid environments in or near woody or grassy areas. The CDC suggests wearing long sleeves, long pants and socks and treating clothing and boots with DEET repellents or permethrin. Other standard precautions include wearing light-colored clothing and tucking pant cuffs into socks. Check your clothing regularly and do a daily body check. That goes for children as well. Prompt removal is essential. “It takes 24 to 48 hours for Lyme disease to be transmitted from a tick to a person,” Foster said. Pets also should be given similar exams. Dogs are susceptible to Lyme disease and can carry ticks into the home, where they may drop off and find a human host. CDC recommends using repellent collars and treatments on pets that go outdoors. Also recommended is removing ticks with a tweezers, grabbing it as close to the skin as possible and pulling it straight out slowly, making sure its mouth parts are removed. Then it is time to cleanse the skin and apply an antiseptic. Foster dispelled the notion that ticks drop out of trees. “They’re generally found on low-lying vegetation. How high they go depends on their life stage. Larvae and nymphs want mice and chipmunks. Adults are higher up to get whitetail deer. They do not drop out of trees,” he said. Of course, there was no convincing my friend that was so. This entry was posted in Uncategorized and tagged Birds, Camping, Centers for Disease Control, Deer, DEET, Dogs, Hiking, Lyme Disease, Michigan Department of Community Health, Nature, Paddling, Permethrin, Ticks. Bookmark the permalink.